Bridal shower decorating with candles can help you set a special mood. The color and scent of a party candle can be strong and vibrant, or soft and romantic. Whatever your party decoration idea, candles can transform your setting. Scented candles can add to your guests experience. You can choose from romantic candles with a light floral hint, the sweet smell of berries, the whiff of banana nut bread, and countless other flavors. You have plenty of choices to reinforce your theme. • Bridal shower decorating with candles is easy. Look at your room. Decide what types of candles would fit best, and where. You will probably use a combination. Do you have any particular areas you'd like to highlight? Tables are obvious, but look to spaces where a party candle might add some interest, such as a small shelf. As a general rule, groupings usually look best in odd numbers (three candlesticks, five votives.) If there is a mirror in the room, place candles in front of it. This gives the appearance of twice as many candles, for a dynamic effect. Brainstorm and have fun. • Tapers: these are the tall thin romantic candles we're all used to. They come in different heights and colors. Use three or more of these, on side tables or mantles. Vary the height for additional interest. Use all one color, or 2-3 shades of the same color. • Pillars: these can be round or square, and come in different sizes. A bridal shower table centerpiece can be made using 3 or more pillars, in different sizes, on a charger plate. You can add colored glass, marble, etc., around the candles. • Floating candles: these come in the shape of flowers, animals, butterflies, fruit and more. They can be used in floater bowls, glass cylinders, or goblets. Add water to the holder, then insert your floaters. A great bridal shower decorating with candles idea, is to use food coloring to tint the water. This creates an inexpensive but dynamic party candle look. • Candelabras make an elegant statement when used at the center of a table, or on a mantle. These romantic holders are always a crowd pleaser. • Tea lights and Tea light Holders: tea ights are small and usually come in metal containers. They are placed in tea light holders, which are found in numerous decorative shapes. You're sure to find some to fit your party. Cute candle houses would accent a kitchen, bedroom or craft theme. 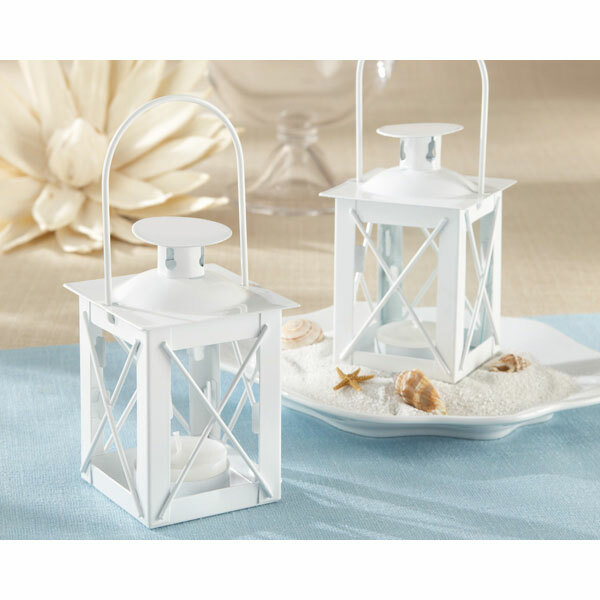 • These mini lanterns with tea lights are cute table decorations or favors. They could be adapted to any seasonal theme. • Tarts and Tart Burners: tarts are the size of a small cookie. They come in all different colors and scents. They are placed in burners that heat the tarts to release the aroma. Bridal shower decorating with candles can be this simple, and still get rave reviews. 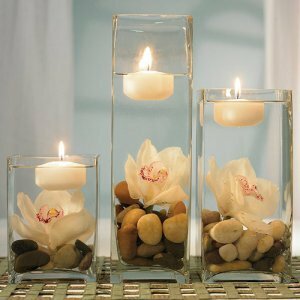 • Containers: these candles are already in jars or glass. They come in different shapes, sizes, colors, and scents. They are great in any area. Don't forget the powder room. • Citronella candles: these are for outdoors, only. They control bugs by attracting them to the candle, not away from them. Take this into consideration, when placing these. Keep in mind the mood you want to set, your color scheme and theme. <b>Bridal shower decorating with candles</b> is fun and impressive.